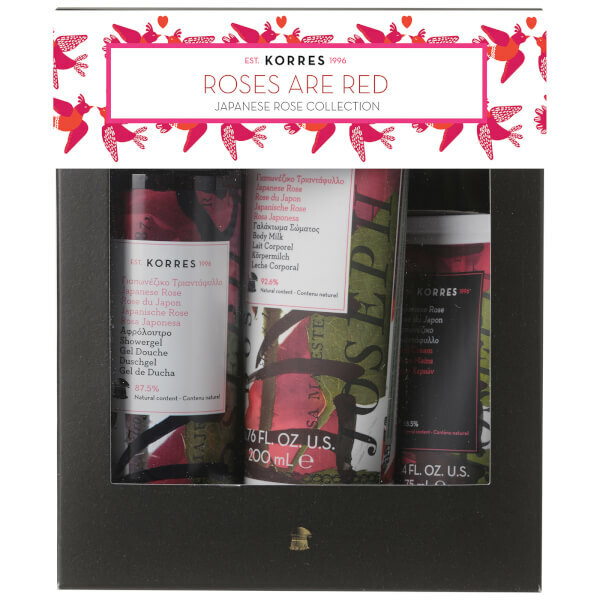 Harness the power of fragrant, uplifting Rose Bud with the KORRES Roses are Red Collection. Bringing together three deeply nourishing and delicately scented skincare products, the gift set contains everything you’ll need for super-soft and healthy skin. Fortified with Althea Extract, the regenerating shower gel infuses the skin with a delicate, velvety Rose Bud scent to leave you feeling relaxed and comforted. Locks in moisture and hydration to reveal super smooth skin from top to toe. Envelop the body in a veil of fragrant moisture with a hydrating formula that leaves skin feeling smooth, refreshed and nourished. The moisturising milk delivers a veil of essential and long-lasting hydration that eliminates areas of dryness. 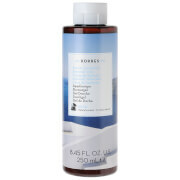 Enriched with Almond Oil, the luxurious solution delivers anti-inflammatory benefits and a comforting, soothing feel. A calming dose of Aloe Vera encourages cell regeneration and skin healing, whilst hydrating Shea Butter shields the body from UV aggression and therefore prevents wrinkle formation. Nourish and care for hard-working hands with a lightweight and intensely moisturising formula enriched with Shea Butter and Almond Oil to help soften and comfort dry, rough skin. Formulated with 88.5% natural content, the hand cream blends Calendula with Vitamin B5 to expertly nourish and repair; it melts effortlessly into skin, leaving no oily residue, and effectively hydrates and comforts whilst imparting a subtle perfume of Japanese Rose Buds. Showergel: Lather with water and wash as required. Body Milk: Apply to body as often as required. Hand Cream: Apply to hands when needed. Showergel: Aqua/ Water/ Eau, Sodium Laureth Sulfate, Cocamidopropyl Betaine, Sodium Cocoyl Isethionate, Coco-Glucoside, Glyceryl Oleate, Parfum (Fragrance), Aloe Barbadensis Leaf Juice, Althaea Offcinalis Root Extract, Arginine, Benzyl Alcohol, Castoryl Maleate, Citronellol, Guar Hydroxypropyltrimonium Chloride, Helichrysum Arenarium Flower Extract, Hydrolyzed Wheat Gluten, Hydroxyisohexyl 3-Cyclohexene Carboxaldehyde, Imidazolidinyl Urea, Lactic Acid, Limonene, Phenoxyethanol, Polyquaternium-7, Potassium Sorbate, Sodium Dehydroacetate, Sodium Gluconate, Tocopherol. Body Milk: Aqua (Water/Eau), Caprylic/Capric Triglyceride, Prunus Amygdalus Dulcis (Sweet Almond) Oil, Glycerin, Hydrogenated Polydecene, Glyceryl Stearate Citrate, Ammonium Acryloyldimethyltaurate/VP Copolymer, Butyrospermum Parkii (Shea Butter), Decyl Cocoate, Parfum (Fragrance), Aloe Barbadensis Leaf Juice, Althaea Officinalis Root Extract, Caprylyl Glycol, Citronellol, Distarch Phosphate, Glycine Soja (Soybean) Oil, Helichrysum Arenarium Flower Extract, Hydroxyisohexyl 3-Cyclohexene Carboxaldehyde, Limonene, Magnesium PCA, Manganese PCA, Panthenol, Phenoxyethanol, Rosmarinus Officinalis (Rosemary) Leaf Extract, Sodium Gluceptate, Sodium PCA, Zinc PCA. Hand Cream: Aqua/Water/Eau, Glycerin, Glyceryl Stearate, Caprylic/Capric Triglyceride, Ethylhexyl Palmitate, Peg-100 Stearate, Butyrospermum Parkii (Shea) Butter, Hydrogenated Polydecene, Propylheptyl Caprylate, Cetearyl Alcohol, Prunus Amygdalus Dulcis (Sweet Almond) Oil, Helianthus Annuus (Sunflower) Seed Oil, Aloe Barbadensis Leaf Juice, Distarch Phosphate, Orbignya Oleifera Seed Oil, Acrylates/C10-30 Alkyl Acrylate Crosspolymer, Ammonium Acryloyldimethyltaurate/Vp Copolymer, Benzyl Alcohol, Butylene Glycol, Calendula Officinalis Flower Extract, Cetyl Alcohol, Citronellol, Lactic Acid, Limonene, Malachite Extract, Nymphaea Caerulea Flower Extract, Panthenol, Parfum/Fragrance, Peg-20 Stearate, Phenoxyethanol, Potassium Sorbate, Punica Granatum Fruit Extract, Sodium Benzoate, Tetrasodium Glutamate Diacetate, Tocopherol, Tocopheryl Acetate.